The AG channels Hyundai's "fluidic sculpture 2.0" design language into a long hood and refined character line down its length. TOKYO -- Hyundai, feeling pinched in its South Korean home market by premium import brands, will add a "flagship" sedan between the Azera and Genesis. An exterior design concept of the front-wheel-drive car, dubbed the AG, was unveiled last week at the Busan auto show in South Korea. 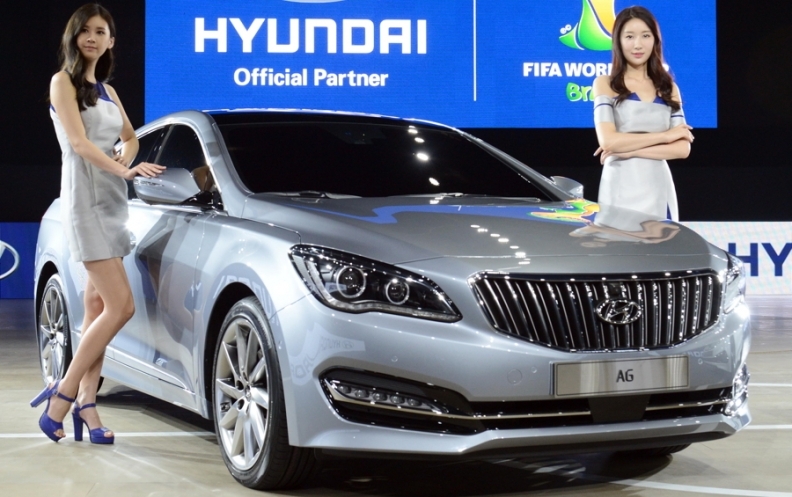 A production version goes on sale in South Korea in the second half of 2014, Hyundai said. The company has no plans to sell the AG overseas, a Hyundai spokesman said. Hyundai calls the AG its "new flagship premium sedan," even though it will still offer the larger Genesis and top-shelf Equus to "show the importance we're placing on this model," company spokeswoman Meeyoung Song said. Hyundai is trying to better target niche pockets for premium cars in its home market, especially as competition ramps up from German brands. Sales of imports have soared after recent free-trade agreements with Europe and the United States. "The competitive landscape is changing in the domestic market and we need to respond more," Song said.